You're able to enter in any additional income & expenses that will be incurred throughout the scenario as well. In your proposition you can have four main types of income - livestock, milk, cropping, horticulture and other income which will contain all other revenue accounts. You can add new forms of income at any time using the button below. Add any milk production, fill in all details of the milk production like region & supplier. You'll be provided an additional year for your milk tracker, this year will run prior to the first year of your scenario and filling this in will then calculate the deferred payments in the first year of your scenario. If your milk tracker did not exist prior to the first year of your scenario - then you can leave this first column / year blank. NOTE: If your farm is banking with BNZ, your milk prices are set automatically for you. 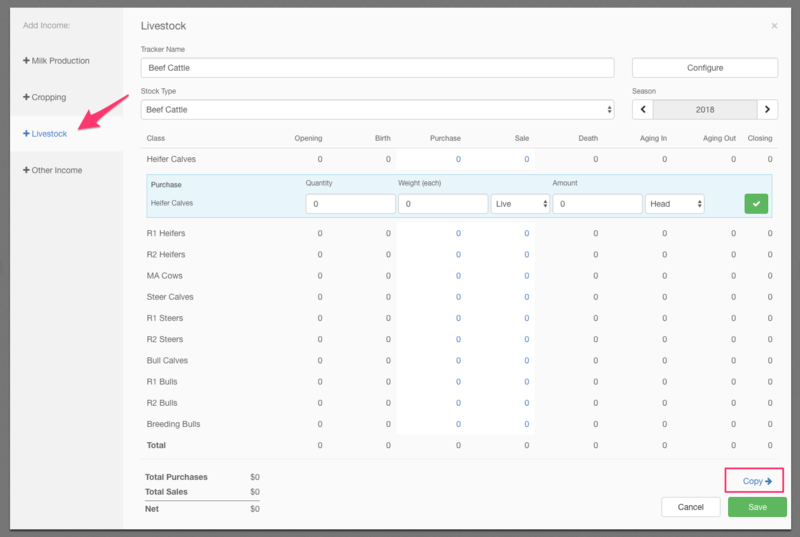 Add your desired livestock type and enter in any movements within the stock classes. Clicking on the blue numbers in the grid will allow you to enter transaction details. Once you have entered all transactions for year one of your scenario you have the ability to copy those transactions to all future years by clicking the 'Copy' button. You can then edit any future year's transactions, as required. Ageing, births, and deaths can be auto-calculated based on the settings available under the livestock management configuration page. 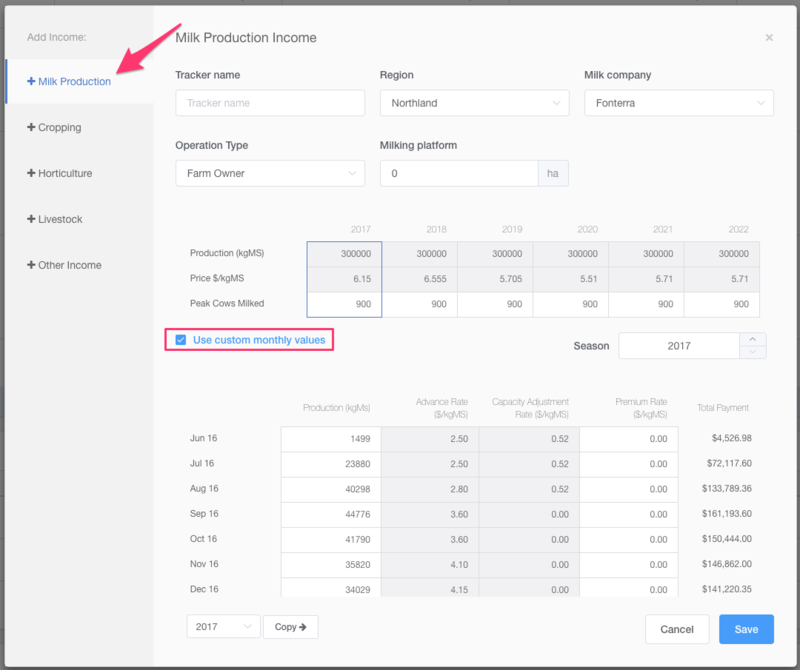 If you're using a milk tracker and dairy cattle tracker, a dairy livestock tracker can be added and the Net Sales from it can be calculated by using the $/kgMS that flows from the milk tracker - as opposed to entering individual sales & purchases for each stock class. Add a dairy cattle tracker as above, and ensure you click into the $/kgMS tab. This cannot be changed back to a detailed view once created. 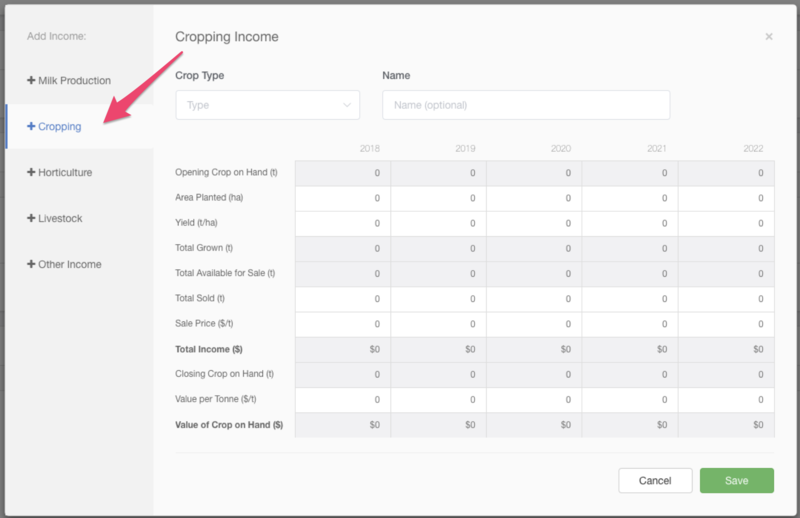 Add in cropping income by specifying your crop type and then entering area planted, yield, total sold and sale price. The opening crop on hand (if any) will flow through from the opening position. 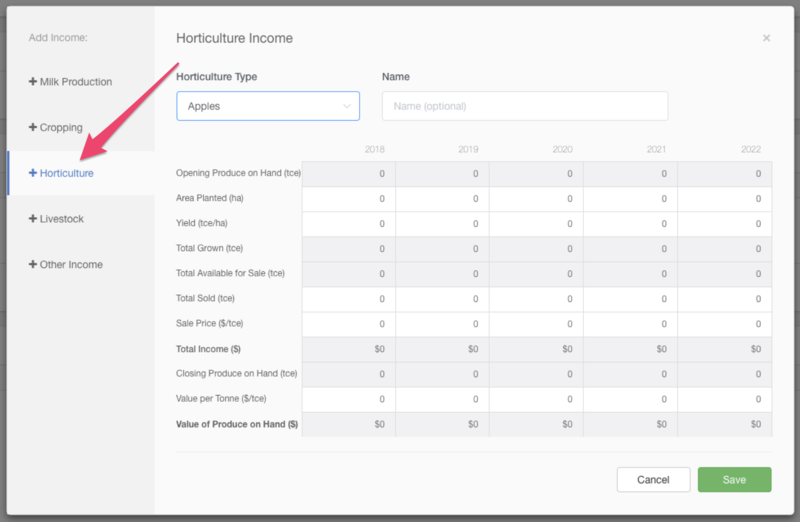 Add in horticulture income by specifying your horticulture type and then entering area planted, yield, total sold and sale price. The opening produce on hand (if any) will flow through from the opening position. Values can be entered for the first year of your scenario and "spread" across the subsequent years using the button and % box provided, or they can be manually entered. Under your expenses all interest from any liabilities will be automatically calculated and brought forward to your expenses. All other parts of your expenses can be configured using + Add Expenses. 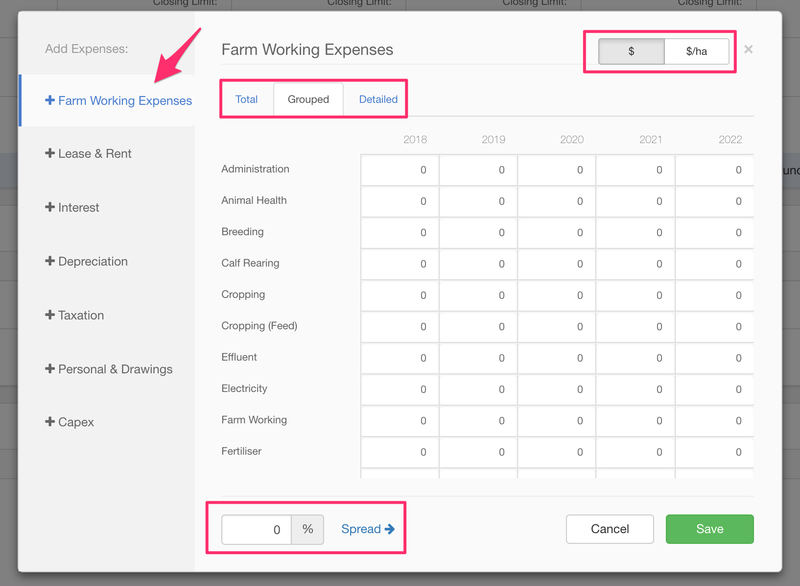 Farm working expenses can be added as $, $/kgMS, $/cow, or $ha depending on the items you have added to your scenario. They can also be entered as one of the three views - total, grouped, or detailed. You can update all other farm expenditure in the same way as FWE with the same tools available - $, $/kgMS, $/cow, and $/ha. 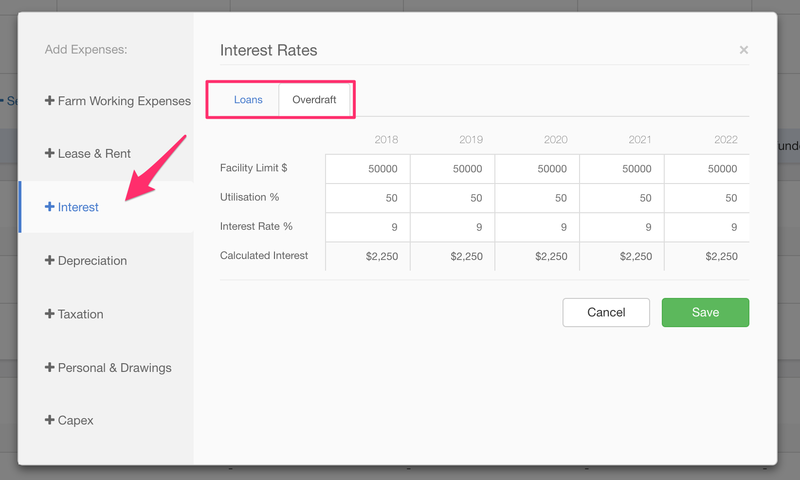 You can also adjust the interest rates / utilisations for any loans or overdrafts under your expenses section. NOTE: Taxation is currently a manual calculation and should be entered once you have completed your scenario and know what your Net Profit is.